On Bonfire Night, we excitedly wrapped up warm in our hats, winter coats and gloves and set off to Milford Marina to enjoy Milford Haven Roundtable’s Annual Firework Display. It was a cold rainy night but we knew it would still be on whatever the weather. We saw lots of fireworks as we walked into town. Sorry my photos aren’t the best as my priority was watching the kids in the dark so I took most of them one handed! The rides and lights at the end of the dock looked so pretty. We arrived and it was lovely to see so many people had turned up, the car parks were overflowing and there was a good crowd. A park and ride had been organised to help people who needed to drive in. Shops and cafes were open along the docks too. The display is free to enter but as always we each donated money for our entry into the buckets on the way in. We were then offered a wristband for the kids to wear in case they got lost- a great idea! We bought some light up toys for the kids and headed for the stage to meet our family. By the Radio Pembrokeshire stage we listened to music, chatted with friends and family and the kids played with their light ups! Before we arrived there were a number of acts including Jay James, We meant to go around the rides and stalls too but the fireworks were due to start. There was a very lovely moment when Round Table Chairman and our friend Mark proposed to his girlfriend and she said yes! We all cheered! We wish them all the best! Then there was an announcement that someone had lost their child- so easy to happen when in the dark. Everyone helped to find the boy, it was announced at the stage, volunteer stewards were on the look out, the house lights were kept on and the fireworks were postponed until we all knew he was safe. The great news is he was found very quickly and it’s good to see how this situation was dealt with so well and also how so many people came together to help. Then it was time for the fireworks. There is always a great display set to music. One of the songs this year was the Red Dwarf theme tune which I love so I’ve used it in this years video. Last year my favourite song from the display was Christina Perri’s “A Thousand Years” so I used it in our Bonfire Night 2015 video. I wasn’t standing in the best spot to fully enjoy the display, but it was a great spot for enjoying the entertainment and catching up with the community so that was perfect for me. We accidentally broke the group up while the fireworks were on but we all got back together again once they were over. Danny enjoyed some pie and mash. Izzy thought he had ice cream! Dave and John (with their matching “kids on shoulder” accessories) had a catch up! A happy Rebecca with her light up bunny ears on! I think Caitlyn was tired! She was happy really (yes she still has a broken arm too. Her next fracture clinic is this week so her break will be reassessed then). We said our goodbyes, and threw our left over coins into the donation buckets to say thank you for this lovely event and made our way home. I love the glow and the smell of sparklers. Then we came into the warm for hot chocolate with cream and sprinkles. We also had Oreos and finished off the last of our Italian Firework Cookies. It was a lovely Bonfire Night. Sadly, there have been lots of complaints (and general moaning) about the night across social media. Thankfully the majority of people I know all really appreciate the Round Table going to the trouble of putting this event on for the town FOR FREE. It’s a lot of hard work for the volunteers who all have jobs and families of their own. They don’t get to relax and enjoy the fireworks with their own families. It’s great if people sign up to join the Round Table after these events as they always need more hands and constructive suggestions are useful but insults and groaning are not. We all enjoy celebrating occasions in different ways and that’s fine but I know the kids and I are already looking forward to next year’s Bonfire Night thanks to the Round Table so I hope this event continues (and I will be there earlier next year so we have more time for rides and the bands!). Thanks to Milford Haven Round Table and Milford Marina! 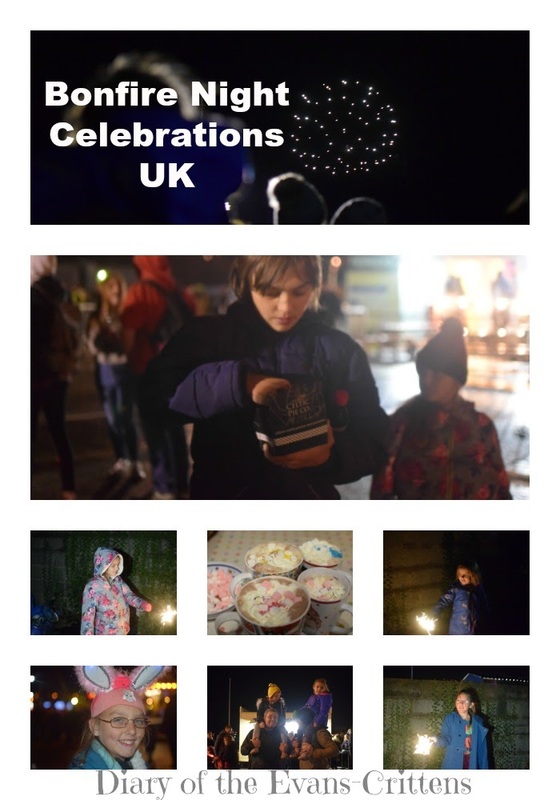 You can watch our video of the night here: Bonfire Night 2016.